Elected 461; the date of his death is given as 28 Feb., 468. After the death of Leo I, an archdeacon named Hilarus, a native of Sardinia, according to the "Liber Pontificalis", was chosen to succeed him, and in all probability received consecration on 19 November, 461. 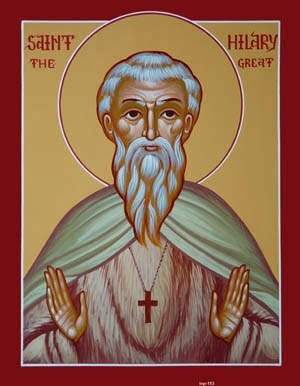 Together with Julius, Bishop of Puteoli, Hilarus acted as legate of Leo I at the "Robber Synod" of Ephesus in 449. There he fought vigorously for the rights of the Roman See and opposed the condemnation of Flavian of Constantinople (see FLAVIAN, SAINT). He was therefore exposed to the violence of Dioscurus of Alexandria, and saved himself by flight. In one of his letters to the Empress Pulcheria, found in a collection of letters of Leo I ("Leonis I Epistolae", num. xlvi., in P.L., LIV, 837 sq. ), Hilarus apologizes for not delivering to her the pope's letter after the synod; but owing to Dioscurus, who tried to hinder his going either to Rome or to Constantinople, he had great difficulty in making his escape in order to bring to the pontiff the news of the result of the council. His pontificate was marked by the same vigorous policy as that of his great predecessor. Church affairs in Gaul and Spain claimed his special attention. Owing to political disorganization in both countries, it was important to safeguard the hierarchy by strengthening church government. Hermes, a former archdeacon of Narbonne, had illegally acquired the bishopric of that town. Two Gallican prelates were dispatched to Rome to lay before the pope this and other matters concerning the Church in Gaul. A Roman synod held on 19 November, 462, passed judgment upon these matters, and Hilarus made known the following decisions in an Encyclical sent to the provincial bishops of Vienne, Lyons, Narbonne, and the Alps: Hermes was to remain Titular Bishop of Narbonne, but his episcopal faculties were withheld. A synod was to be convened yearly by the Bishop of Arles, for those of the provincial bishops who were able to attend; but all important matters were to be submitted to the Apostolic See. No bishop could leave his diocese without a written permission from the metropolitan; in case such permission be withheld he could appeal to the Bishop of Arles. Respecting the parishes (paroeciae) claimed by Leontius of Arles as belonging to his jurisdiction, the Gallican bishops could decide, after an investigation. Church property could not be alienated until a synod had examined into the cause of sale. Shortly after this the pope found himself involved in another diocesan quarrel. In 463 Mamertus of Vienne had consecrated a Bishop of Die, although this Church, by a decree of Leo I, belonged to the metropolitan Diocese of Arles. When Hilarus heard of it he deputed Leontius of Arles to summon a great synod of the bishops of several provinces to investigate the matter. The synod took place and, on the strength of the report given him by Bishop Antonius, he issued an edict dated 25 February, 464, in which Bishop Veranus was commissioned to warn Mamertus that, if in the future he did not refrain from irregular ordinations, his faculties would be withdrawn. Consequently the consecration of the Bishop of Die must be sanctioned by Leontius of Arles. Thus the primatial privileges of the See of Arles were upheld as Leo I had defined them. At the same time the bishops were admonished not to overstep their boundaries, and to assemble in a yearly synod presided over by the Bishop of Arles. The metropolitan rights of the See of Embrun also over the dioceses of the Maritime Alps were protected against the encroachments of a certain Bishop Auxanius, particularly in connection with the two Churches of Nice and Cimiez.